Al-Qaida's new senior leader is trying to co-opt Syria's revolution with a message of anti-Americanism and hate, in a new video translation recently released to jihadi forums. "Peace be upon you while you teach the rebellious, treacherous, traitorous system severe lessons on how to resist him, his corruption and treachery, his compliance in favor of the global hegemony and his desertion of Golan," Ayman al-Zawahiri says in his attack on Syrian dictator Bashar al-Assad. "Peace be upon you, O champions and heroes! Indeed you have presented a great example, teaching your Arab and Islamic Ummah lessons about sacrifice, resilience and fighting injustice." In the clip, "The Glory of the East Begins with Damascus," Zawahiri paints America as responsible for pulling the strings of Syria's brutal regime. His conspiracy theory alleges America wants to manipulate the region for its own interests and to protect Israel from the wrath of the revolution. Notably, Zawahiri tries to blend traditional al-Qaida ideas with Syrian resistance to the regime. This means praising the martyrs in Islamist strongholds like Homs and Hama, showing local bravery as a rejection of American intervention in the Middle East, and manipulating popular grievances against Israel to strike out against the United States. The propaganda includes reciting a long line of salutes and poetry about Syria's famous warriors and conquerors, and also incorporating modern martyrs into the list. "Peace be upon you, O courageous and fierce, free and noble, in Daraa, Jisr ash-Shugur, Ma'arrat al-Numan, Baniyas, Homs, and Hama, the land of heroism and martyrdom," Zawahiri said, recognizing places where Syrians had staged protests. Most important was the mention of Hama, an Islamist stronghold that witnessed repression of modern Islamist protests and the brutal crushing of a Muslim Brotherhood revolution in February 1982. "Whenever a martyr falls from amongst you, hundreds of others present themselves for martyrdom, and whenever someone is imprisoned, hundreds of others offer themselves, ready to sacrifice," Zawahiri said in praise of the revolution's fallen. Al-Qaida has traditionally rejected the Muslim Brotherhood's approach of removing un-Islamic regimes through civil activity and elections, so the salute to the MB's martyrs may show a warming of ties toward either the Islamist groups or protesters in general. Such a warming would be consistent with Zawahiri's first statement as al-Qaida's leader, where he pledged, "we offer our hands and open our hearts to cooperate with everyone working on supporting Islam in the Islamic groups and organizations and outside of them" – even those that are not Jihadist groups. Staples of al-Qaida's ideology were also part of Zawahiri's exhortation to Syrian protesters. 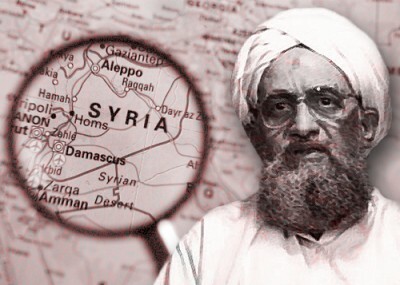 "Say to him [Assad]: In fact it is you who is the leader of the gang of criminals… the partner of America in the war against Islam, which they call the 'war on terror,' and the guardian of the Israeli borders," Zawahiri stated, reinforcing the American "war on Islam" narrative. As part of his praise of Syrian resistance, Zawahiri sounded an optimistic note that protesters had supposedly not been impressed by American sanctions. "I believe you not to have been fooled by the plots of the global hegemony and the ruses of the new Crusades," he added. "America, who worked with Bashar al-Assad throughout his tenure, now claims to be on your side, after it has seen the earth overcome with the tremors of your anger and after its plans were foiled in Tunisia and Egypt by the loss of two of their most important agents!" The United States has had sanctions on Syria since 2004 and has increased them in recent months. Zawahiri also accused Washington of trying to take control of the revolution to protect Israel, a country which is universally unpopular in Syrian society. "Washington today seeks to replace Assad, who sincerely guarded the borders of the Zionist entity, with another regime which will end your uprising and Jihad, a government which will grant the Ummah some of their rights, but in essence will still be obedient to America and will safeguard the interests of Israel," he said. Syrians have a responsibility to rise up and shout out to America about its hypocrisy, al-Qaida's new leader said. "Tell America and Obama that you are the children of great conquerors, the progeny of Mujahideen… Tell them you are waging a war of liberation and freedom – liberation from the corrupt idolic tyrants and liberation for the Muslim lands. "Tell them that your blessed anger and awesome uprising will never settle, Allah willing, until you raise the victorious flag of Jihad over Mount Scopus in our beloved and usurped land of Jerusalem," he stated, focusing on a target that had been a part of Israel since its founding. One of the obvious gaps in al-Qaida's propaganda is its lack of a physical presence in Syria. Zawahiri addressed this by claiming that his fighters were busy fighting against the "new crusades," and that they were held back by "borders and restrictions penned by Sykes and Picot, then sanctified by our [Arab] rulers." However, he consoled Syrian Islamists by saying that Syria is "the land of Islam and martyrdom" and it "has enough mujahideen for themselves as well as others." If al-Qaida has its way, Syrian efforts to topple Assad will open a new battlefront with America and Israel. "May Allah reward you with the best of rewards, on behalf of Islam and the Muslims," Zawahiri concluded. "May the Majestic reward you, O sons of Damascus, the Glory of the East begins with Damascus!"